Welcome to you all to the official opening of our Hombu Dojo. Those of you who have been around for a long time know that it has been a long term plan of mine to establish a headquarters. Looking at the people around me I have great memories of all the great experiences we have had together. Let’s start with Nives. I am smart enough to know what is important in life. If I forget Nives she will remind me vocally. Believe it or not Nives and I started karate together over 40 years ago. In fact closer to 45 years ago. She has been at my side ever since. Personally I think she thinks I am nuts starting a fulltime dojo at my age. It was suggested that I should be winding down at my age. As if that’s going to happen. The walls of our dojos are is a history of my karate life. Every poster and picture holds a memory that I cherish. I am indeed a fortunate man. My family, Jessica, Brian, Michelle, Mitchell, Rubika, Leo and soon to be another Grandson with no name as yet are very special to me. As most of you know family is everything to me. You just have to look at the windows to realise what values I consider important. My memories are not just displayed on the walls my students/friends are who are here tonight are all part of my history. My thanks to the students who have been with me since their childhood and some would say mine as well. Adam Camuglia, Iona Scott, Rebecca Bartlett, Kellie Shimmings, Duncan Scott, Jerome Durham, Rudi and Donald James and finally Hani Zahra, who has travelled from Sydney to celebrate the opening. Also a big thanks to Dr David Young. He could not make it tonight. But he is the most important volunteer we have at our tournaments. He looks after the welfare of our kids. A special thanks to David and Julia Watts. Our history goes back to the late 70’s I appreciate you making the long trip from the south west to help me celebrate this milestone in my karate life. Thanks to all my senior instructors you know who you are. Too many to mention. My wife has warned me not to waffle on. All of you at some stage put many hours into what we see around us today. I was delighted as to how much the Yoseikan family rallied to help. I have a few presentations to make. There are some key people who contributed to the renovations who I would like to thank publicly. One man stands alone. Thanks Colin McLaughlin without your support and expertise the dojo would not look like it does today. He spent more hours here than I did and that is really saying something. He shared my enthusiasm and still does. We are both proud of our achievement as I believe all our members are. There have been hundreds of problem jobs. To date Colin has never failed to come up with a solution. Thanks Colin I will not forget. We had the mirrors delivered for free on the condition that we had to offload them. I had no idea how we were going to do it. Colin did, he arrives with four sets of suction cups designed for moving glass. Come on no tradesman I know carries a spare set of glass suction cups. Colin does. We only chipped two mirrors. Adrian watched us install some of the mirrors and said that he was not going to risk breaking any and then coping with my anger. By now you would have seen the photographic record of the creating of our dojo. It was a mess when we started in early February. Now look at it. Next on the list is Derek Scott owner of Perth Stripes and Signs. Derek started karate with me in the late 70’s. He was one of our early black belts. We have been friends ever since. He has always been supportive of Yoseikan and is always willing to help with his expertise. He is responsible for all the signage. You have to admit they are impressive. Unfortunately he is not here to accept his award and has chosen Rudi James to accept on his behalf. About 18 months ago I was in Bali with some friends including the Durham’s when I brought up the possibility of not re-leasing this building and using it as a dojo. Jerome and young son Mitchell jumped on the possibility and in fact gave me the hard sell. In the end Jerome bribed me. He said he would do the catering for the official opening. At that stage I still had reservations but eventually I took the deal. Thanks Jerome or maybe I should thank Mitchell he was very enthusiastic. Next I would like to thank Michael and Anita Fiore – Metro Hardware. I am grateful for your support and generosity. We were participating in the Margaret River for the long weekend. Not Michael he was busy building all the bag storage units you see in both dojos. He also helped us with the laying of the floor and the cabinets in the kitchen. I was overwhelmed by your contribution. I would also like to thank Steve, Karina and of course Olivia for supplying the crays. I know Steve drove all the way from Dongara to make the delivery. I was touched by the effort you went to. I know your family understands why the Yoseikan family is so important. Monica McGuire is responsible for creating our new website which was designed to highlight the opening of our fulltime dojo. I know you will all agree that she did an outstanding job. Everyone has been talking about it. Once again I am personally grateful and do appreciate your work. I would also like to thank Des Sanft for our punching bag support it’s not quite finished yet. I am gratefully. Please accept this bottle of Moet. Maybe you can get rid of the kids for one night and enjoy it. I will babysit. 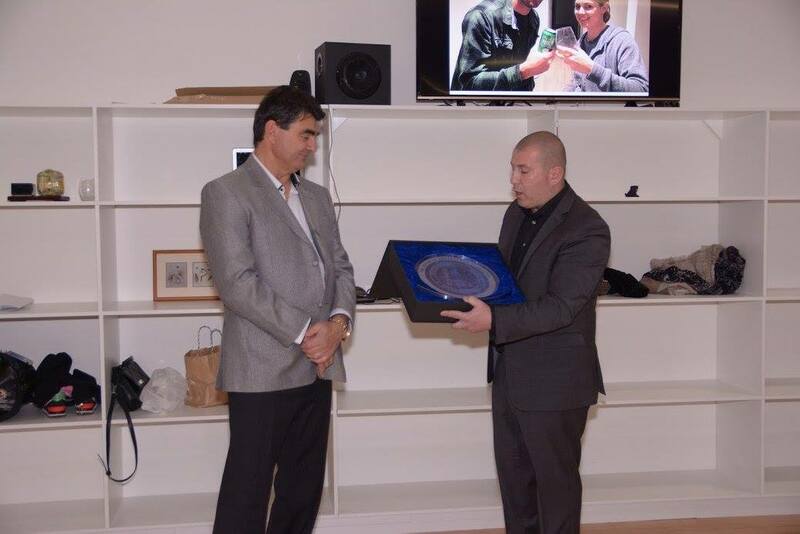 I was pleasantly surprised when Robert Rogerson representing our Melville Dojo instructors presented me with a mounted commemorative bottle of saki. It is the traditional Japanese way to open a new dojo. Thanks to all of you. 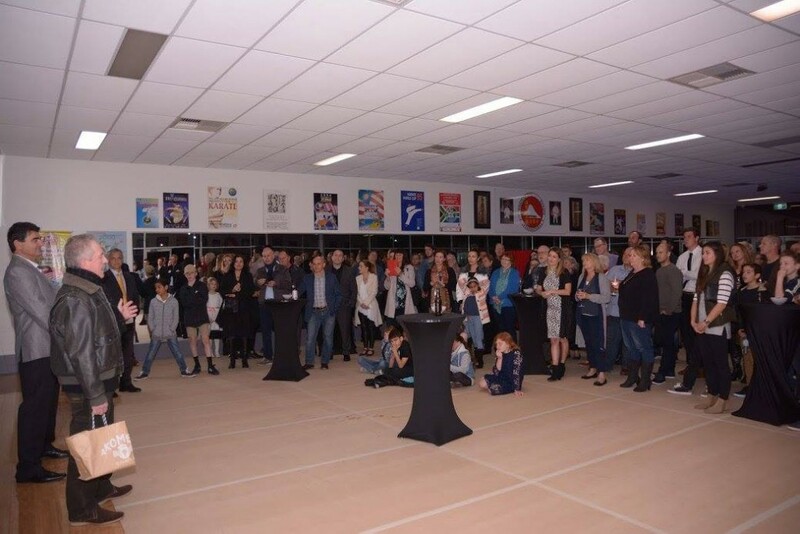 Hani Zahra, chief instructor for Yoseikan-Ryu Karate NSW also made a speech and presented us with a commemorative crystal plate with Yoseikan-Ryu Karate and the meaning of Yoseikan engraved on it. Also a big thanks to Kiera Sanft. I asked her to do a kata. A big ask for someone so young. Like all Yoseikan members she rose to the challenge and did an outstanding job. 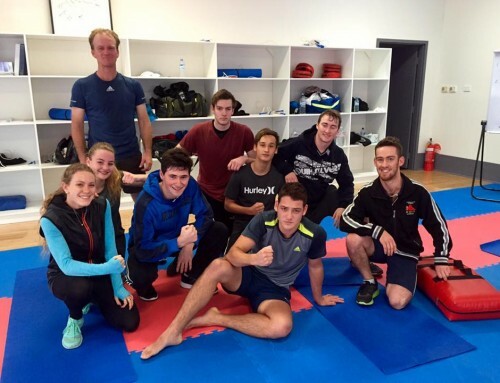 Mitch Durham did an outstanding version of UNSU then the boys below did the bunkai. It was an amazing demonstration of good strong karate. Without a doubt it was one of the highlights of the night. Thanks boys or should I say men. Thanks to the Fiore girls and Kim Buchannan for assisting with the food service. Your effort was appreciated. 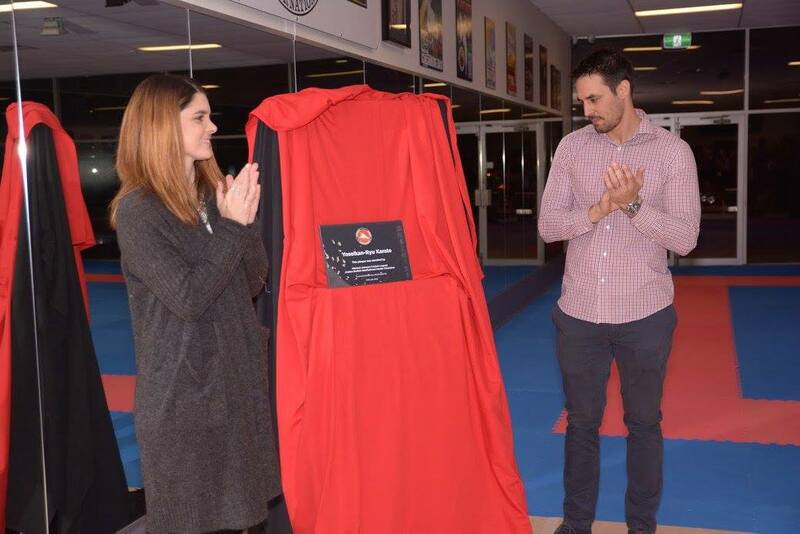 I have asked Mitchell Johnson – Cricket legend and Jessica Bratich Johnson international karate champion to unveil the foundation plaque. Finally thanks to Richard Staynor for once again being our MC.